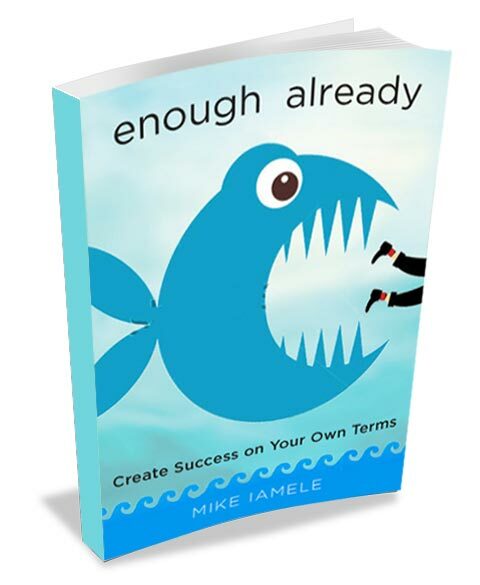 Enough Already is the battle cry for a new generation of success seekers. It captures the fire and spirit of anyone who’s fed up with the dysfunctional pressures of success that leave us all burnt out and miserable. Divided into 12 stages, this book takes you on a journey though the vital steps to define and create sustainable success on your own terms. Through provocative discussion, brutally honest confessions, and an unmistakable voice, Iamele challenges us all to take back control of our lives and chart our own path to happiness. And, for once, we feel compelled to listen. "We can all learn something from Mike Iamele's honest and authentic thoughts on redefining relationships and success." "[Mike's] zeal and grit are invigorating - here's hoping he is right when he writes that money, power and recognition are no longer the only game in town...4 out of 5 stars"
"I've read a lot of books designed to help me guide my mind and my actions to a more successful place, but none of them have been like Mike's." "Mike shares his story with refreshing sincerity and authenticity. His story gives the rest of us the courage to define success in our own terms. Thank you, Mike, for being open and honest. You're an inspiration when it comes to true success!" "It's rare that a book genuinely makes you look at yourself, your potential, and your entire way of life differently." "Mike Iamele has a way of putting things in a different light, a way of telling you what you didn't know you needed to hear exactly when you need to hear it. He's not only a guiding force, but he's real. He's easy to relate to and understand because he doesn't put any walls up."